If you are dared to drink a St Pauli Killer, don’t do it! I’m serious. If someone, say your work mates, dares you to drink a St Pauli Killer on a weeknight after you have already consumed a Mojito (cocktail containing 3 different types of rum), do not do it! Also don’t follow it up with a white Russian, a free shot of some weird cherry thing and a shot of vodka. But it was the St Pauli Killer that did all the damage, I swear. This bad boy contains 7 different types of Rum, Apricot Brandy and then a splash of lemon, lime, orange, passionfruit juice and grenadine. It’s basically the Hamburg version of a Long Island ice tea. It tastes great and there in lies the danger. It’s only when you try to stand up that you realise the damage that has been done. 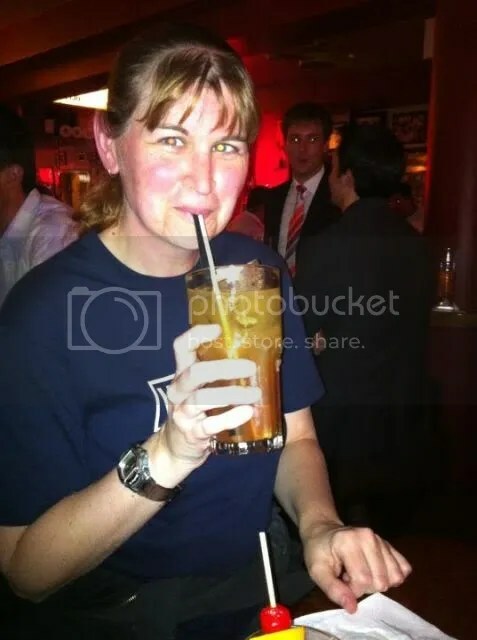 To further scare you away from this evil monstrous cocktail, I present photographic evidence of me drinking one. Note the bright pink checks from already consuming one cocktail, what the hell was I thinking. Learn from my mistake and when dared to drink this cocktail of the inevitable hangover, just say no! This entry was posted in Life and tagged Cocktail, Just Say No!, St Pauli Killer. Bookmark the permalink. 5 Responses to If you are dared to drink a St Pauli Killer, don’t do it! And dayum you are looking cute. Come to Hamburg and I will shout you one. Actually that sounds really good…. The drink tastes fantastic. It’s just the effects of the drink that are not so good. I wonder if just this drink on its own is safe? Sounds VERY good!